Status: Retired 24 Mar 2016. See the successor Facelift Responsive. This page is only for reference. 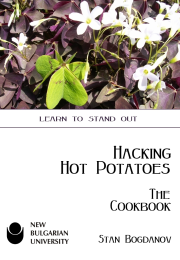 I've heard some people comment on the looks of HotPotatoes exercises; that they look very old fashioned. Indeed, their layout was designed quite a while ago. However, with some smart CSS you can give them great modern 'iLooks'. Here's my improved HotPot/QuizPort icon pack for the HotPotatoes suite, Quandary and TextToys in Moodle. Rather than the shortcut variety, these are the application icons and look much better to me.